If this card is in your GY: You can discard 1 "Vendread" card; Special Summon this card, but banish it when it leaves the field. A "Vendread" monster Ritual Summoned using this card on the field gains.. If this card is added to your hand, except by drawing it: You can Special Summon it from your hand. You can only use this effect of "Trickstar Lilybell" once per turn. This card can attack directly. W..
(Quick Effect): You can reveal this card in your hand, then target 1 "Trickstar" monster you control, except "Trickstar Lycoris"; Special Summon this card, and if you do, return that monster to the ha.. When this card is Normal Summoned: You can add 1 "Trickstar" card from your Deck to your hand. Each time your opponent activates a Spell/Trap Card, inflict 200 damage to them immediately after it reso..
(Quick Effect): You can Tribute 1 "Gouki" monster, then target 1 "Gouki" monster you control; it gains ATK equal to the original ATK of the Tributed monster until the end of this turn. If this card is.. When this card is Normal Summoned: You can Special Summon 1 "Gouki" monster from your hand. 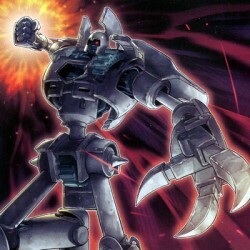 If this card is sent from the field to the GY: You can add 1 "Gouki" card from your Deck to your hand, excep.. If you control no monsters, or all monsters you control are "Gouki" monsters, you can Normal Summon this card without Tributing. If this card is sent from the field to the GY: You can add 1 "Gouki" ca..